Staff at local law firm help sight loss charity Beacon by donating £1,100 towards new technology. 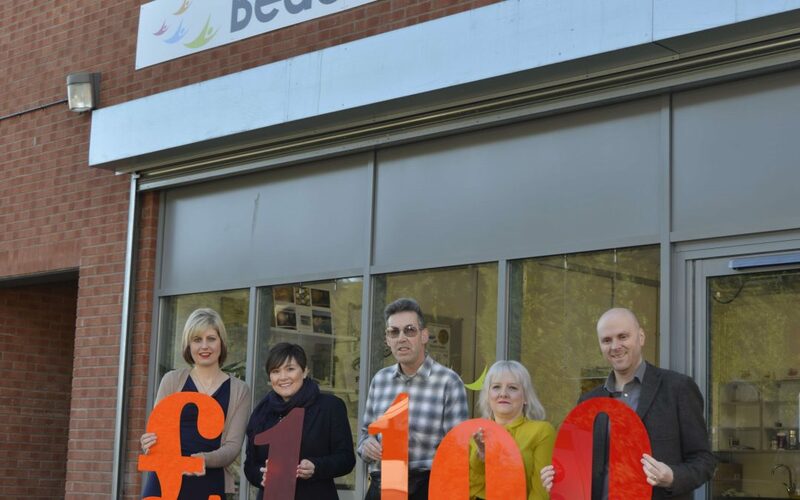 A legal practice which operates in Brierley Hill has donated £1,100 to Beacon. The large donation was made by Higgs & Sons Solicitors and will help fund new equipment in Beacons HQ on Wolverhampton Road East. The Law firm has chosen several charities to support this year and specially selected Beacon for its work with people living with sight loss. The solicitors helped raise the funds via several initiatives which included a football tournament, the three peaks challenge, a regatta, a pub quiz, the Worcester half marathon, cake sales and lots more. Tim Jones, Partner and Head of the Corporate Social Responsibility programme at Higgs & Sons Solicitors, said: “We know the important work Beacon does across the Black Country and Staffordshire and we are proud of the difference this donation will make. Everyone at Higgs & Sons is dedicated in making a change to our local area so what better way than improving the lives of those living with sight loss through the purchase of new assistive technology. Matt Harrison, Technology Innovations Manager at Beacon, added: “This cash injection will help us fund equipment which will have a huge impact on the everyday lives of people living with sight loss. We will be able to install specialist mobile devices which will talk to people and know what room you are within the building. This will help further modernise our building and take us a step closer to integrating assistive technology into all aspects of Beacon.